To learn more about our upcoming activities please read our Fall 2018 newsletter. You can also read our Fall letter here. Thank you for your continued support of projects in our sister community of Santo Tomas. The Thurston-Santo Tomas Sister County Association is pleased to announce the upcoming visit of Marily Aguilar, Yessenia Solis, Elvis Aguilar, and Cruz Murillo as the 12th delegation since 1990, in the spirit of hermanamiento. Our guests will be here from April 17th till May 11th, to find our when you can connect with our visitors please refer to the list of our exciting events below. They've received their travel visas and we are now in the process of setting up their itinerary, activities and homestays. Please email tstsca@gmail.com if you would like to get involved or have ideas or questions. We will also need strong interpreters, support with transportation and events. We've set aside the April 22, 29 and May 6th Sundays as possible dates for heading up to the mountain, depending on the weather. 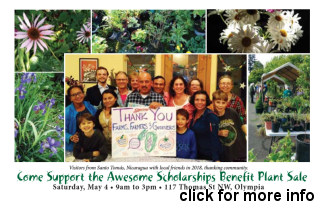 Departure time for the carpool will be 9AM from the Lincoln Elementary parking lot (21st and Washington, Oly). We'll try to decide about the weather by the Thursday before each of those dates to find our one snow day with the visitors. Check for updates on our facebook: Tstsca Thurston-Santo Tomas or email tstsca@gmail.com. 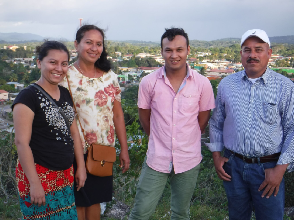 Welcome our visitors from Nicaragua! Marily Aguilar Oporta is one of the recent university graduates whose scholarship was funded by the TSTSCA. She studied Pedagogia (Teaching) and we hear great things about her engagement with young children. She is currently working at the local Centro de Desarrollo Infantil, a state supported free childcare center. She looks forward to this educational and cultural exchange with colleagues in her field. Yessenia Solis Miranda is the principal of Ruben Dario school that is sistered with Lincoln Elementary here in Olympia. She initiated this relationship with current Lincoln Principal Marcela Abadi when she visited here 20 years ago. The students, teachers and families here (and there) are so excited about her return visit! She has also been the main Spanish language and literature teacher for Evergreen students who spend spring quarter studying and volunteering in Santo Tomas every other year. Elvis Javier Aguilar was also a college scholarship recipient supported by the TSTSCA; he graduated as an agro-industrial engineer and now works for a food products company as their main quality control tech. His visit to Olympia will enrich his work in Nicaragua while inspiring college students here to see how their agriculture studies can lead to solid careers. His family has hosted Evergreen students and we can now reciprocate their hospitality. Cruz Murillo Sandoval is a member of the Comite para Desarrollo Comunal de Santo Tomas, our sister organization. He will bring a personal and historical framework of Nicaragua's reality to Olympia. He will also speak about El Comedor Infantil (children's free lunch program), La Biblioteca (the library project), Proyecto de Becas Universitarias (the college scholarships project), La Finca Modelo (the model farm), La Escuela Hermandad (night and weekend technical school-baking and beauty), La Casa de la Mujer (women's sewing school and other resources) and La Clinica Popular (health clinic), all of which the TSTSCA has been involved in helping support for almost three decades. Thank you for your continued support of projects in our sister community of Santo Tomas. 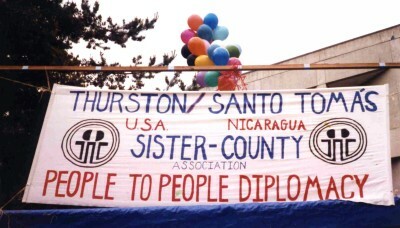 Welcome to the website for the Thurston-Santo Tomas Sister County Association. For vistors new to TSTSCA, we hope you'll enjoy getting to know us via the website, and perhaps take advantage of several ways to join in the work. For those who are already part of our history, we hope you will like the old photos and newsletters and will also find this a useful way to keep connected.